See/read letter written from Bill Lynn to Wilma Short of Sewickley Heights, Penn on Dec. 22, 1942. Received two letters of yours, today. One written the 23rd of November, the other a v-mail letter written the 31st of August, the new and the old. Don’t you ever change the way you have been writing your sweet letters! I’ll admit they just about knock me off my feet, but it’s just what I want to hear. I wish I could put into words what I have in my heart and mind, but I am afraid I would make a mess of it. Perhaps you’ll remember some of [the] things I told you a long time ago. It all goes double, now. I am glad to hear that my aunt calls you once in a while. She is one person I can really depend upon to understand me. I’ll never forget the one day that I asked her advice, but unfortunately I didn’t follow it. So I am to receive some snapshots, at last. It certainly took a long time to talk you into it. I hope it don’t take me that long to get results on something else I have in mind to ask you, someday. I suppose when you get the air-mail letter I sent you with the picture of our native girls, I’ll be in for a scolding. I was going to put a letter in for Officers Training School, this month, but after I had a talk with my Captain, I decided to wait a little longer. I need a little more experience. After all, I am practically a “boot” in this men’s outfit. I have his recommendation but I wouldn’t want to go up for it, and fail to make the grade. Time out! The mail man just came again. Yes, another letter from Wilma, one you wrote Thanksgiving Eve. I’ll answer it tomorrow. It’s getting close to “taps,” and I’ll have to make a “bed check” soon. I have the duty once every eight days and one of the duties is to see that all good Marines are in bed. No, I don’t tuck them in. Goodnight darling – miss you very, very much. Want to read another letter from Bill to Wilma? 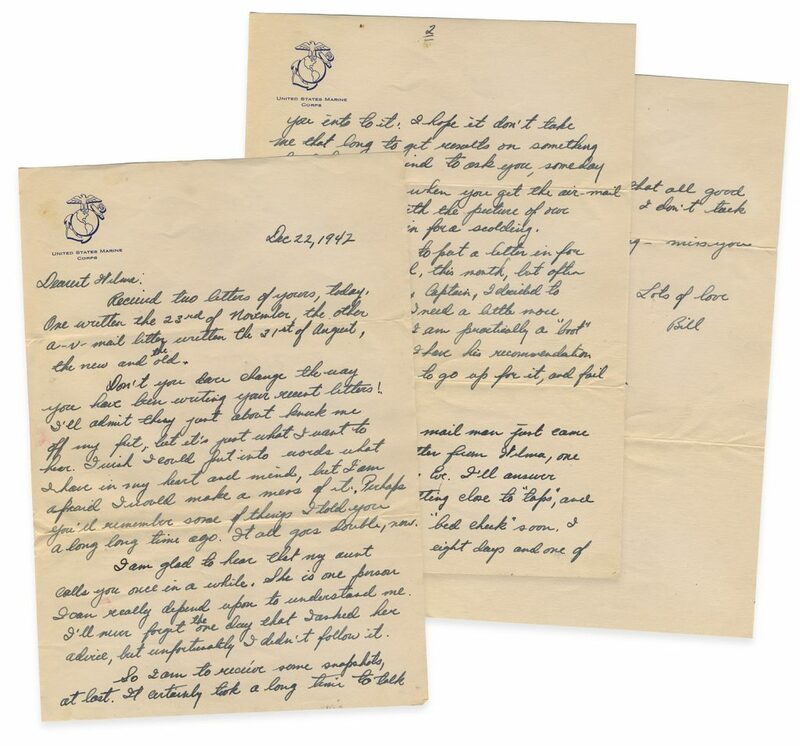 Click here to see/read a letter written the previous day, December 21, 1942.